but also they who recognize these telescopes, while not inexpensive to acquire, offer the best long-term value. 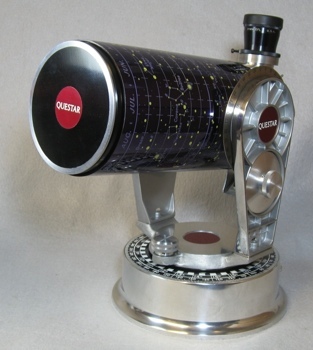 Questar is the telescope for people who wish to buy such an instrument only once in their lifetime. Company Seven Astro-Optics Division is the authorized agent for the Questar Corporation and as such we do offer full sales and factory warranted service support of all consumer and industrial products. All repairs are documented and entered onto the production and maintenance records of the particular instrument. We strive to be informative and so we have listed prices for services and parts here that are current as of the time this article was authored. These prices are not likely to change over the course of a year or so and therefore these are good guidelines. However, you may wish to contact us for exact current prices. Company Seven can not provide any information about how to disassemble our telescopes, nor can we sell any replacement parts which require disassembly of the instrument, or special installation procedures. We do however, post information at our our "Library" section explaining how to perform simple cleaning of the telescope exterior optics, and we can provide replacement attachments (Lens Cover, etc.). replacement of any minor worn bushings or gaskets. reduction of undue "mirror shift"
we produce a comprehensive report which will advise you of the telescopes potential performance (visual, photographic, and CCD), as well as an exact measure of the Barlow within your telescope. Appraisals: If you plan to donate a telescope and will require a certified appraisal, then Company Seven can provide that professional appraisal of an instrument. The appraisal will be acceptable by the U.S. Internal Revenue Service, and most insurance companies. The cost of these services start at $100. It will require that the instrument be sent in to us or we visit for inspection. Replacement Parts: If one is absolutely certain of what other repairs or service are necessary, then we can offer a more detailed reply about the cost of replacement parts. It is very likely that any external missing parts can be easily replaced, and service needs even of older instruments remain supported. Any parts which we employ will be new, Questar replacement parts as installed on production telescopes. At times, older Questar telescopes (typically made before 1970) may require that we custom manufacture an exact duplicate replacement part. Or, we may be able to offer an identical used part that has been reconditioned to function and appear as new. Company Seven will never offer a used part unless we have the customers approval first; all normal guarantees apply. Questar Instruction Manual would cost $20.00; please add $3.50 for postage/UPS shipping. Questar Dust Cap/Lens Cover would cost $35.00; please add $3.50 for postage/UPS shipping. A selection of Questar and third party eyepieces that might serve your observing goals better. The selection includes eyepieces which provide improved eye relief (to better accommodate eyeglass wearers for example), wider apparent and actual fields of view, higher magnifications, and better clarity and color fidelity. These choices can have a particularly favorable improvement for those earlier Questar telescopes that included the older style 40-80X and 80-160X eyepieces. Upgrades or conversions: There have been some changes over the years which might render modern accessories incompatible with an older instrument, or that might require modification of an older telescope to accept the new accessories. 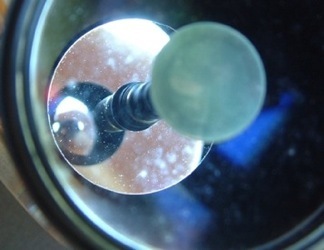 Such modifications are not always suggested as they may adversely impact the "original" or "antique" intrinsic or sentimental value of a consumer telescope. Powerguide II: owners of older fork mounted 3-1/2 inch or 7 inch instruments may wish to consider having the "Powerguide II" drive corrector installed in the drive base. The optional "Powerguide II" drive system is one of the most important innovations for the Questar since its introduction. The Standard and Duplex Questar telescope models are furnished with a drive base, and with a set of three very lightweight alloy legs. When assembled into a tripod configuration (the legs thread into the drive base at two points on the side, and one at the bottom to adjust latitude), then this permit the telescope tracking function to operate on a table top. The drive base is normally furnished with a 120 Volt AC. (or 220 volt optional for overseas operation) synchronous motor system and power cord. This cord then plugs into a wall outlet and allows the telescope to track at a Sidereal rate. However, one must specify your preference of either North or South Hemisphere when ordering this drive system. This is completely satisfactory for a person who operates the telescope for viewing only from one location that has A.C. power (such as at a school). This upgrade replaces the synchronous A.C. powered motor, with a silent, very efficient servo motor drive. The wiring and motor are housed within the drive base, and one small inconspicuous RJ - telephone style female connector is recessed into the bottom of the drive base. A palm sized hand control box is also furnished, this houses the easy to replace battery and is connected to the drive base by a flexible cord. This "Powerguide II" drive operates from a common alkaline 9 Volt D.C. battery for up to 50 hours, or longer with a Lithium battery! A drive corrector circuit with hand control paddle permit functions including the selection of drive rate (Lunar, or Sidereal), and fine speed correction changes of +-1.4 or 10X. All control is done with "On Off" switch, and four (E-W-N-S-) buttons, there are no switches on the drive base - all is on the hand paddle that plugs into the bottom of the base. An internal Quartz reference circuit continuously checks motor speed (every 0.6 Arc Sec.) and adjusts it if necessary. But the most important aspects of this option are that it frees a person to travel around the world, to the North or South Hemisphere independent of external power supplies. 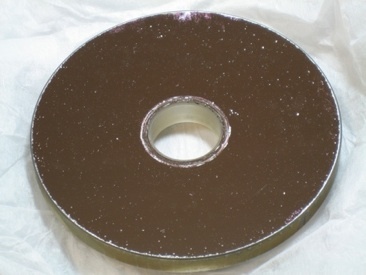 Owners of older Questar astronomical telescopes or of Field Model instruments who wish to observe the Sun can purchase the Solar Filter for the Finderscope; this component is easily installed by the operator of a telescope. The astronomical Questar telescope models include a Solar Filter for the objective lens (a smaller aperture 1" off-axis filter, or upgraded 3-1/2" full aperture filter). 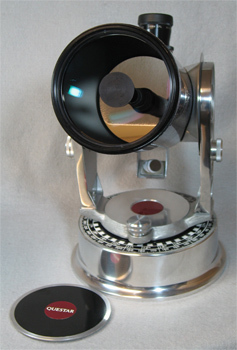 The Questar astronomical instruments made after the 1960's include a solar filter that can be switched into position over the finder. 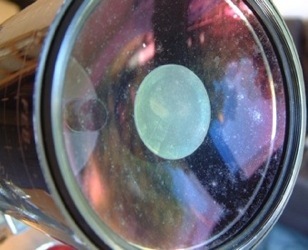 This second filter makes it possible for an operator to find and center the Sun in the field of view of the telescope; but more importantly this filter eliminates the possibility that someone might accidentally switch the telescope control box settings from observing through the safely filtered telescope, to an unfiltered finder. Conversions: It is possible to convert one instrument into another. For example, a Field Model birding or surveillance instrument may be converted into a "Duplex Model" telescope, all the while retaining the versatility of its original configuration. The conversion program for owners of Field Model (and Birder) instruments who also seek the capability to use the telescope for astronomy with a tracking mount. is our "Field Model Duplex Conversion". The current cost of this is $2,120.00 plus shipping. This conversion re manufactures a "Field Model" and returns a "Duplex" telescope with second eyepiece, solar filter for the finderscope, carrying case, fork mount with AC motor synchronous drive. A complete "Standard Service" of the Field Model optical tube assembly is included as a part of this $2,120. conversion program. A conversion may result in a completely new instrument for example; we may convert an older MFL 7 (multiple focal length instrument commonly used in law enforcement, intelligence, and defense industries) telescope into a modern, automated Step Zoom 180 telescope thereby resulting in a savings of some thousands of dollars to the owner. Some of our Long Distance Microscopes are designed to accept motorized focus options, automatic light control units, or an upgrade from manual control to fully automated configurations. Company Seven may accept an instrument in trade against a newer model. Common Mechanisms of Failure: there are a few common modes that tend to damage optics of a telescope, these are: 1. mechanical impact damage, 2. fungus/mildew, 3. coatings deterioration. If the telescope main optical system or its other components or oculars show a light haze then this may be fungal in origin. Superficial contamination by mold or mildew may usually be cleaned and the spores neutralized with modest expense of time and materials. Typically these organisms secrete enzymes that degrade materials into simpler substances which can be absorbed by the organism. 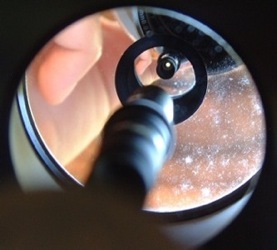 These enzymes can not only dissolve the antireflective and protective coatings but given time will etch into the silica (glass) of the telescope. In these instances it is very important that the telescope be serviced as soon as possible, and before permanent damage occurs. If the glass is etched then it is usually not cost effective to grind, polish and figure the optics, so we would simply replace the optic(s) component after re matching or as a complete matched set (corrector lens and primary mirror) from a new production lot. Above: views of Questar Standard 3-½ telescope made in 1984 as returned to us in 2009 for service with advanced coatings deterioration due to fungus. 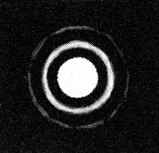 Left to right: Corrector Lens (31,743 bytes), Primary Mirror as seen through Corrector Lens (25,233 bytes), and closer view of Primary Mirror (23,244 bytes). Above: views of the same Standard 3-½ telescope above but after its service visit to us including replacement of the optics set. At right is the original Primary Mirror replaced during this service visit. Even after superficial cleaning this can not simply be recoated or otherwise salvaged. Click on images to see enlarged view (153,801 and 153,801 bytes), note your Browser must enable 'pop up' windows.. In any case we really need to inspect the optical tube to determine what repairs if any are needed. When a telescope is in such a poor condition that it is beyond being cost effective to repair, then we can accept them traded in against another instrument, or purchased outright where we will then either use them for parts or for static display in our telescope museum. Especially over recent years we see more and more used Questars being traded, some even misappropriated - 'eBay' bargains coming in for service where the unwary buyer thought he was getting a bargain, only to be shocked by the costs to refurbish the telescope. To Return an Instrument: to us we suggest the telescope and any other optical accessories such as eyepieces be securely packaged. A local shipping/packing service may be engaged to do this. The instrument should be wrapped in bubble wrap, or if shipped in the original carrying case all voids within the case should be filled (between the fork arms and the walls of the carrying case, the void between the instrument lens cover and ceiling of the carrying case, etc,) with bubble wrap packing materials. Any loose items (eyepieces, etc.) should be bubble wrapped and packed with the case but not inside where they may work loose and scratch the telescope. Be certain to enclose a letter with your name, shipping address, telephone number (day/evening), and E-Mail address describing what you wish to have done to the instrument. If paying by credit card then you may also include the card number and expiration date. The entire box should then be placed within a larger box with all voids within filled with packing materials. Ship the package by either United Parcel Service Ground delivery, or UPS or Federal Express two or three day air, or by US Mail Priority service. A full value insurance for replacement of the contents should help to guarantee proper handling. The turnaround time for either service or conversions will be about three to eight weeks depending on the nature of the work, and our current workload. The busiest time for us typically is between October and January, and so during these months service repairs may be delayed by up to an additional several weeks. If we can be of assistance to you in any way, then please visit, or call us at 301-953-2000, or send E-Mail to Company Seven. Company Seven's highly expert staff will be your counsel to assist you to tailor an instrument to meet your personal goals, or the mission of your agency.